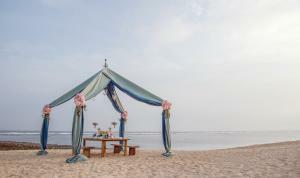 NUSA DUA, BALI, INDONESIA, July 10, 2018 /EINPresswire.com/ -- You deserve to have a wedding that is as extraordinary as your love story, one that lasts a lifetime in your memories and those of all your guests. The idyllic tropical island of Bali is a worthy venue to enter into Holy Matrimony and nowhere is more special than The Ritz-Carlton, Bali. Our skilled Wedding Specialist will go beyond expectations to bring into reality your most cherished dreams and craft something that is uniquely you, adding those special touches of Bali to make it unique. 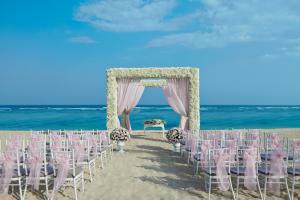 A beachfront ceremony at The Ritz-Carlton, Bali will give you a wedding day of enchantment; walk down a flower pathway flanked by page boys with ceremonial umbrellas and flower girls in traditional dress with the azure waters of the Indian Ocean, the cerulean sky, the sound of the gentle waves lapping in the shore and a gentle sea breeze as the perfect backdrop. As you and your beloved pledge your life to each other, sink your toes in the sand as you stand framed by an exquisite floral arrangement in the gorgeous surroundings made even more beautiful by The Ritz-Carlton, Bali team. 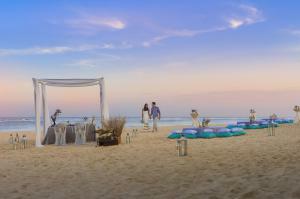 “At The Ritz-Carlton, Bali we believe in creating enduring memories for all our guests. Our highly professional Wedding Specialists are available to assist with custom made arrangements, so that your wedding is an extraordinary experience,” says GM Karim Tayach. Leave our team to make all the arrangements, so you can relax and be pampered by the heartwarming service and excellent facilities at The Ritz-Carlton, Bali, including a special romantic couple’s spa treatment in the elegance of The Ritz-Carlton Spa, Bali. Your Beachfront Wedding Package includes a 2-night stay in one of our suites, a Christian blessing or commitment ceremony, celebrant, string duet, the use of preparation rooms for the bride and groom, flowers for the bride and groom, flower arrangements, decorated chairs for up to 30 guests, a wedding toast and wedding cake, and much more. For more information and to reserve your special day, please contact our Ladies and Gentlemen at rcswgccs@ritzcarlton.com or call to the resort at +(62) 361 849 8988.